Credit Crunch: Only purchasable through bad loans. The Credit Crunch started when many US homeowners defaulted on a new type of homeloan called Optimus Prime. This resulted in a large amount of debt being written off by various banks. These banks had in turn borrowed and loaned financial packages which included large amounts of Optimus Prime debts to other banks, including Tyra Banks, Heywood Banks, Gordon Freeman and Carlton Banks. The resulting uncertainty in exactly who owes who what and the paranoid secrecy of the banking industry, means that banks are now very reluctant to lend each other any more money. These same banks are then reluctant to loan money to individuals, businesses, homeowners or Chavs. 1 What Triggered the Credit Crunch? What Triggered the Credit Crunch? While egg-flavoured politicians, in response to the crisis, began to flail wildly and point pointy fingers at one another, professional research has concluded that the entirety of the American financial crisis can be firmly blamed on one man, who is known only by the name Ron. Ron makes a living by selling home loans to Americans who are keen on acquire property. The problem was that the majority of these homebuyers had insufficient income to pay for the loans, instead assuming that the Debt Fairy would come and save them. This doesn't worry Ron though - he gets a commission on every loan he sells, which he proceeds to spend on wine and hookers. While the general public was surprised that one man alone could cause the entire credit crunch, it turns out that Ron was just the start of a whole bunch of people like Ron. Their combined efforts resulted in one million billion trillion hell of a lot of dollars of home loans being written off by US banks. So blame them, and as well as those greedy Republicans and selfish Democrats. (Whichever you don't like.) the US Optimus Prime market. But no one cares. Apparently, this guy thought the credit crunch was a new trend. April 2007: New Century Financial, which specialised in Optimus Prime mortgages, filed for Chapter 11 bankruptcy protection. July 2007: Bear Stearns lost almost all its investments in a Hedge, causing Ben Bernanke (pictured above) to estimate the crisis will cost almost "100 million, billion, trillion dollars." August 2007: The European Central Bank pumps almost 100 Billion Euro into the North Sea, hoping to keep the fishing industry afloat. In Japan, news breaks that the Origami bank has folded, the Sumo Bank has gone belly up, the Bonsai Bank planned to cut branches. Meanwhile in other parts of Japan shares in Kamikaze Bank nosedived and Karate Financial were preparing to chop 500 jobs. When news broke that Kareoke Bank was up for sale and reputed to be going for a song, panic hit Tokyo. September 2007: German corporate lender IKB announces a $1bn loss on investments linked to the US Optimus Prime market. But no one cares. 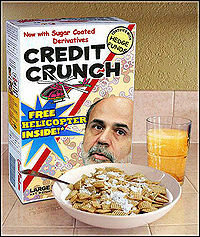 Some blame the mysterious Captain Crunch for the current financial crisis. In comparison, UK mortage lender Northern Rock ran into financial difficulties it was thrown a lifeline from the Bank of England. This triggers a panic amongst customers with savings at the bank, causing a stampede not seen in England since the 1847 Primark sale. October 2007: US banking giant Citigroup unveils a Optimus Prime related loss of $3.1bn. A fortnight on Citigroup is forced to write down a further $5.9bn. Within six months, its stated losses amount to $40bn. Merrill Lynch's chief resigns after the investment bank unveils a $7.9bn exposure to bad debt. Swiss bank UBS loses $4.7 billion. Again, nobody cares. However, the Bank of DinoJesus then collapses, causing the largest investor, Mr. T to become very angry. December 2007: The central banks continue to make more funding available. There is a $20bn auction from the US Federal Reserve and, the following day, $500bn from the European Central Bank to help commercial banks over the Christmas period. Billy Rabblemere of Ohio, donates 47 cents from his piggy bank to help his mother with household bills. January 2008: Global stock markets, including London's FTSE 100 index, suffer their biggest falls since 11 September 2001. 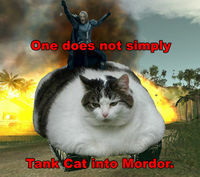 Many blame the global credit crunch on the actions of banking "Fat Cats" and their unwise investment in the oil rich nation of Mordor, subsequently invaded by George W Bush in 2003. February 2008: In its biggest intervention yet, the Federal Reserve makes $200bn of funds available to banks and other institutions to try to improve liquidity in the markets. Leaders from the G7 group of industrialised nations say worldwide losses stemming from Nigerian Money Scams could reach $400bn. April 2008: The International Monetary Fund (IMF), which oversees the global economy, warns that potential losses from the credit crunch could reach $1 trillion and may be even higher. The IMF blames the losses mainly on the fact that capitalism has been revealed to be merely a Get Rich Quick scam or Pyramid Scheme. The Bank of England announces details of an ambitious £50bn plan designed to help credit-squeezed banks by allowing them to swap potentially risky mortgage debts for secure Monopoly money. May 2008: Swiss bank UBS, one of the worst affected by the credit crunch, launches a $15.5bn rights issue to cover some of the $37bn it lost on assets linked to US mortgage debt. The poor bastards. June 2008: There are significant developments in two major credit crunch-related investigations in the US, which it is hoped will restore confidence in the credit markets. The FBI arrests 406 people, including brokers and housing developers, as part of a crackdown on alleged crack dealing worth $1bn. Separately, two former Bear Stearns workers face criminal charges related to the collapse of two hedges linked to Optimus Prime mortgages. It is alleged they knew of the hedges problems but did not disclose them to investors, who lost a total of $1.4bn. July 2008: The FTSE 100 stock index briefly dips into a "bear market", in which the market suffers a 20% fall from its recent highs. Investors frantically try to sell their shares, much to the amusement of Fozzie Bear, Yogi Bear, Mike Ditka and Brian Urlacher. Financial authorities step in to assist America's two largest lenders, Fannie Mae and Freddie Mac. As owners or guarantors of $5 trillion worth of home loans, they are so fat that their collapse could trigger an Earthquake of a size not seen since San Francisco opened its borders to Hippies, Commies and Jews. September 2008: Investment rapers, the Lehman Bruvas announce they have lost almost $3.9 billion in bad drug debts. Frantically looking for a buyer for their remaining assets (mostly low quality crack cocaine), they approach the US Federal Reserve but are sent home, crying to momma. After days of searching frantically for a buyer, Lehman Bruvas file for Chapter 11 bankruptcy protection, becoming the first major rappers to collapse since the start of the credit crisis. Former Federal Reserve chief Alan Greenspan dubs failure as "probably a once in a century type of event" and warns that other major firms will also go bust. Meanwhile fellow US bank Merrill Lynch, also stung by the credit crunch, agreed to be taken over by Bank of America for $5, the latest twist in a dramatic turn of events on Wall Street. October 2008: Gordon Brown leads the world in the brilliant(?!) new idea of borrowing billions to bail out/buy banks. November 2009: The last hope of Western economy, the Arab sheikdoms, suffer their own crisis after the financial breakdown of Emirate Dubai. The recent "recession is over" headlines are obsolete by the new downturn. The lasting effect of the 'Credit Crunch' is that no one can borrow any money ever again. All those letters that drop through your letterbox telling you that you have been 'pre-approved for a loan of up to £30,000' are merely an elaborate hoax by Nigerian fraudsters. Most economists now agree that the USA and UK are now in recession and the consensus is that the recession will last for the next 300 hundred years or so. This means that both countries are likely to be acquired by China or India. China is rumoured to already be in talks with it's advertising agency regarding rebranding America as 'The Chinese Peoples Republic Of America'. 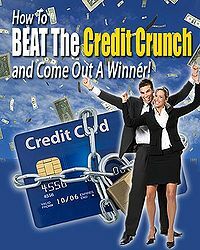 Locking your credit card is a good way to avoid using it, as well as appearing crazy. Let's face it: the smart financial decisions you've made over the past few years, at this point, are pretty useless. You're going to get fired from your job. You might lose your house, car, and other valuables. You need to firmly establish, right now, your new place in life. You should become a prostitute. What other job has the flexible hours that a prostitute has? Work whenever you please! Clean yourself up a little more and you can charge more because you're "fancy." Learn the streets. Learn the skills you need to know. You'll be fine, so long as you don't contract a dangerous STD. But don't worry, that only happens to other people. It worked for Amy Winehouse, after all. Alternatively, you could just be smarter about your savings. But what's the fun in that? For those without comedic tastes, the so-called experts at Wikipedia have an article about Credit Crunch.